Canonical and Skype appear to be setting us up for the beginning of a beautiful friendship. Recent updates to the Ubuntu partner repository now shows Skype as a supported package. It's all there in that magic word, partner . Skype is now a Canonical partner. Given how often I've complained about the lack of a credible open source VoIP client under Linux, this smells an awful lot like good news. Perhaps with Skype opening up to Open Source and Canonical, the days of the Linux port of Skype being the red-headed step child may, one day soon, finally be over. I can dream . . .
To install Skype via Synaptic (under Ubuntu) or KPackageKit (under Kubuntu), you'll need to activate the Lucid partner repository. For those of you running Ubuntu, fire up Synaptic, then click Settings in the menu bar and select Repositories. Click the "Other Software" tab, the click the check box labeled "lucid partner". 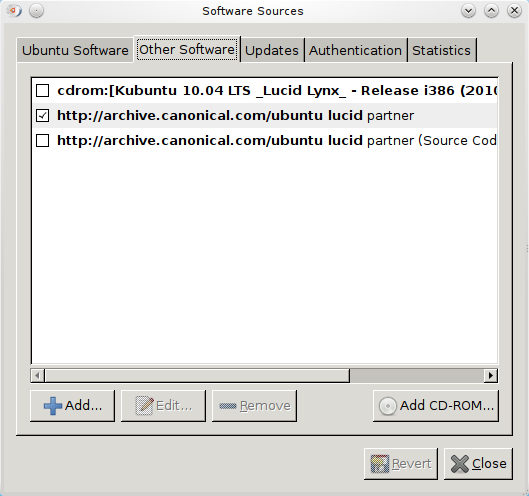 Similarly, with KPackageKit under Kubuntu, click Settings, then click the "Update Software Sources" button. Once again, click the "Other Software" tab and click the lucid partner check box. Another dialog will appear telling you that you need to reload the sources. Click the Reload button and you're just about ready. All that's left is to search for Skype in your favorite package manager's search field, and install. Command line junkies can use either "apt-get" or "aptitude" to get theirs. I have to agree with you Marcel. As much as I would prefer to see an open source client & service take over the world, Skype has such a huge market that it's a plus to be able to communicate with Skype friends over Linux. Of course we've had Skype-ability for quite a while, but making the installation that much easier makes it more attractive to a wider audience.